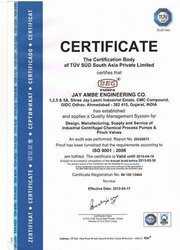 JAY AMBE ENGINEERING Co. has been founded in 1996.we are offering all type of Chemical Process Pump, Industrial Pumps, Pinch Valves & Centrifugal Pump Accessories. JEC Pumps are specialized to handle all forms of fluids transfer be it clear, corrosive liquids or slurry pumping. We believe in accepting challenges and offer tailor made solutions to fulfill customer requirements.The Company has been established by Mr. Rajesh Patel. JEC is an ISO 9001:2008 certified company and has successfully implemented the quality management system at each & every level of the organization through close supervision & stringent Quality Checks. JEC is equipped with all latest technology & machinery to produce world class quality products having utmost precision at every level. Now a days Mrs. Purvi Thakkar is the Marketing Manager of the company. JEC believes in continual improvement in products & systems to cater to emerging requirements of the customers and to enhance the customer satisfaction. R & D team of JEC pump is comprised of highly qualified & experienced technocrats working under the guidance of Mr. Abyanbkar (Technical Advisor of Indian Pump Manufacturing Association) a well renowned name in the pump industry that innovates world class products / solutions and satisfy critical requirements of the customers. Highly vigilant & resourceful management team supported by committed & dedicated employees have made the JAY AMBE ENGINEERING Co. a renowned name in the India as well as in the few of the foreign countries.We export our products in East Asia, Central America, Middle East, South America, South East Asia, North America and Indian Subcontinent. "To establish strong marketing channels to reach each & every part of the world"
To meet the ever rising demands for quality assured pumps, we have set up a well integrated infrastructural facility. It comprises a sophisticated manufacturing unit, quality testing facility, warehouse, and other requisite facilities. Sprawled over a large are, our manufacturing unit is equipped with highly advanced machinery & equipment. In addition, we are empowered with latest design and fabrication technology that further enhance our ability to produce superlative products. We also have a quality testing facility where all the manufactured pumps are tested, using modern testing instruments & equipment. "To extend the product range as per the international standard with fully mechanized and slate of the art technology to penetrate the National & International market"
We are empowered with a team of experts, who are well versed in multitasking manufacturing concepts. Apart, we have a spacious warehouse to safely store the products. We maintain complete stock of the products in the warehouse. However customers can reach us with their customized requirements also.